High Atlas desert tour: Combined tour consisting of a 2-day Atlas mountain trek and a 3-day Sahara tour. The trip offers an opportunity to visit the Moroccan Chamonix called Imlil. 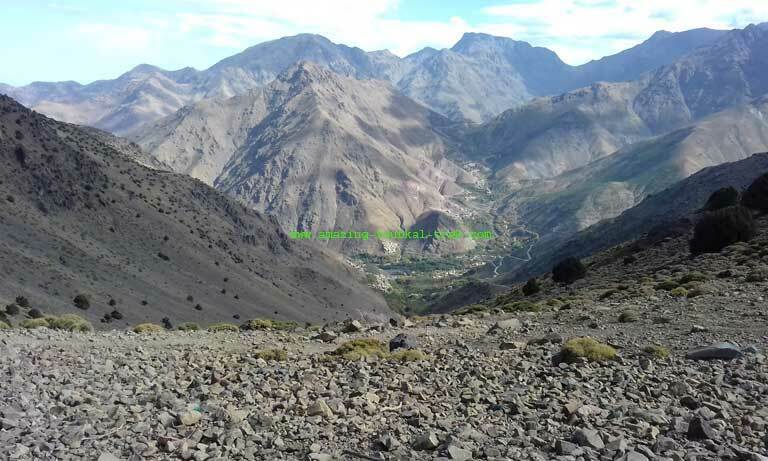 Imlil is where you will begin your Berber villages trek with a visit to Azzaden valley on the following day. You continue your journey to the Atlas Mountains; then you move to the Dades Gorges where you make your first stop. 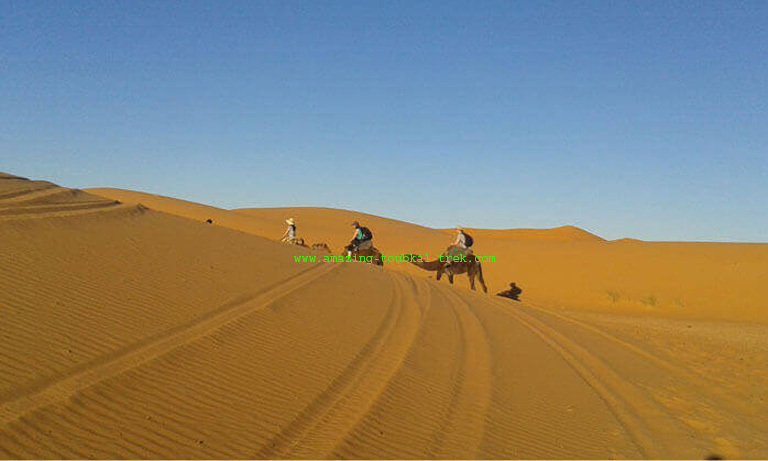 We keep driving till you reach Merzouga where you will take a camel ride and spend the night on the nomadic dunes. In the morning, you begin your return journey via the stony desert, through Ouarzazate into Marrakech. – Enjoy a camel ride in the Sahara desert. After breakfast, you will have time to soak in the sunshine and explore the natural beauty of the Berber villages dotting the exciting valley. We bid Tizi Oussem goodbye to continue our journey to Id Issa village; then we climb the Tizi Oudid mountain pass at 2000m, we cross a wild thurifer juniper forest to reach Mattat village, where we relax near the river and eat lunch under the shade of walnut groves. We pass the night in a local Guesthouse. At 8 am, vehicles will pick you up for the trip to the Atlas Mountains, which will see you driving over the spectacular Tizi-n-Tichka mountain pass. 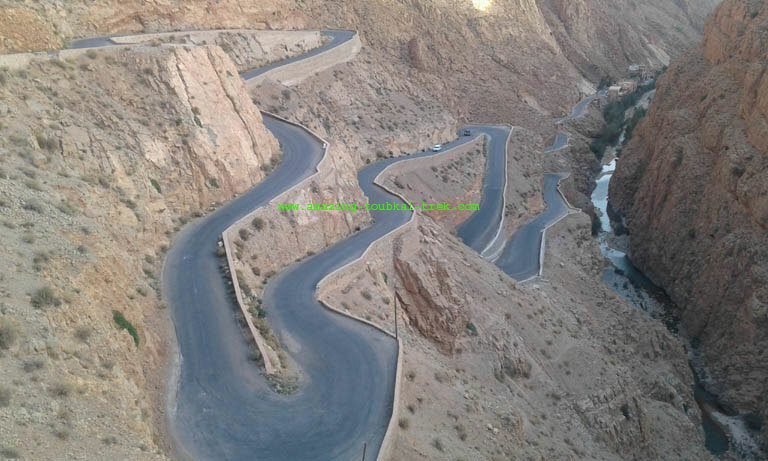 You will be passing through Berber country with many Berber villages along the route. 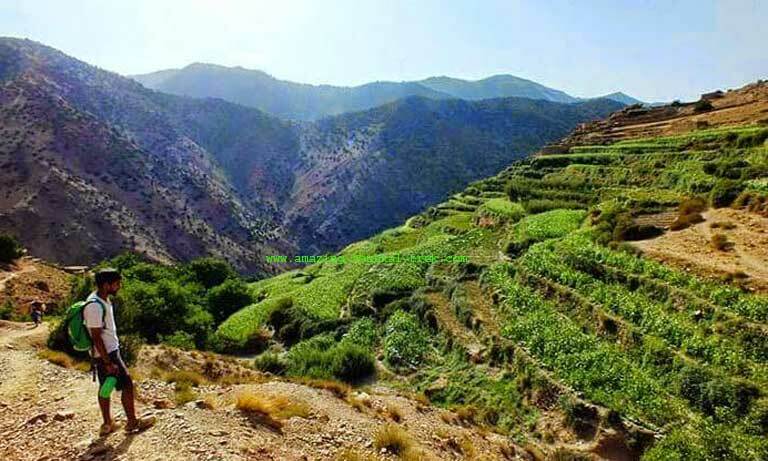 When you get to the desert, you will see barren hillsides with scattered Kasbahs (fortified dwellings where families live with their livestock) and many oases. You may opt for a break to take a tour of the Ouarzazate Film Studios, and you can also take a short hike. At Dades Gorge, you may either go for a walk or decide to relax at the hotel. You will spend the night at Dades. 6hrs drive time. After Breakfast, we drive from Dades Valley to Todra Gorge which is a gigantic fault that divides the High Atlas Mountains. The Todra Gorge rises to a height of 300 meters in a narrow valley inhabited by Berber villages and palm groves. If you wish, you can go on a hike to check out the palm grove, which is a lush oasis with plenty of large date palms. After lunch, the journey continues further into the desert. In the hotel, you will pick up supplies for the desert trip. Afterward, you will take a 1h30 camel ride before sunset to a Berber camp and enjoy local Moroccan dinner. You will spend the night in the desert camp or the open gazing at the stars. Drive time 5hrs. We will set out on a 1hr30 camel ride at sunset for more exploration of the environment and make our return to Merzouga riding on camels. We will take breakfast and shower at Merzouga before heading for the stony desert and the Atlas Mountains, stopping at different spots for photos, lunch, and more viewing of the scenery as we head back to Marrakech. Usually, we should be back in Marrakech by 17:00hrs to 18:00hrs. We recommend going for a 6-day tour if you would like to reduce the distance traveled on the last day. In that case, we advise you to pass the night in the Kasbah of Ait Benhaddou. (You will spend four days in the desert). – The High Atlas desert tour is available and can be arranged for groups of all sizes. High Atlas desert tour: Discover both the Atlas Mountain and the Sahara Desert on the same trip. Combined Atlas Mountain Desert Tour, High Atlas and Sahara trip.